Get ready for Easter with these 10 Tips for the Best Easter Egg Hunt. These simple egg hunt tips will help you make some amazing memories with your family & friends. One of my kid’s favorite parts of Easter is the Easter Egg Hunt! They never know what treasures they will find or who will get the most. Nobody likes an Easter Egg Hunt that is a dud with either too few eggs, or poorly hidden easter eggs. 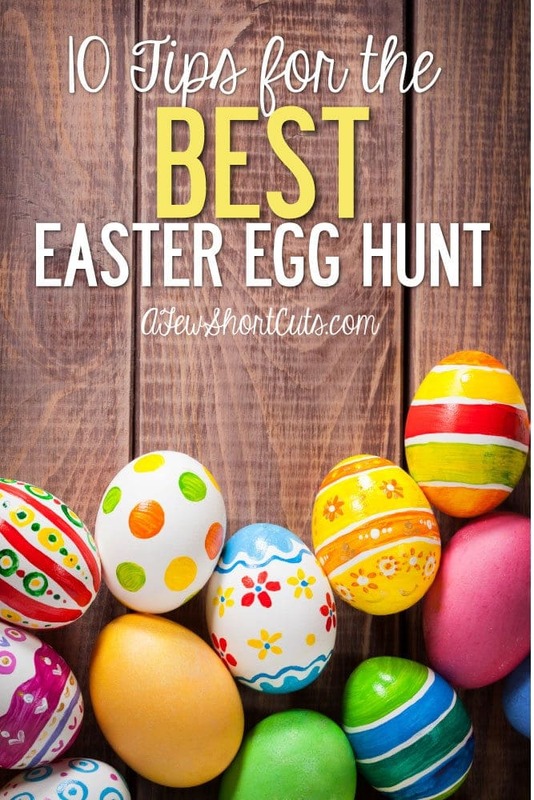 Check out these 10 Tips for the BEST Easter Egg Hunt and have a blast with your family making memories this Easter. Pick the right size plastic eggs depending on the age of the child. The smaller eggs can pose a choking hazard. The dollar store has a huge selection of inexpensive plastic eggs. Plus the bigger the egg, the bigger the prizes, right?! Buy your eggs and fillers early and have them stuffed and ready to go. It is nice not to have to worry about them last minute. Stores crazily start putting them out not long after Valentine’s Day. Keep your eyes peeled. Another great tip is to pick them up on clearance after Easter for the next year and stash them away. Some stores offer as much as 70-90% off! Have an area designated for your hunt. Don’t have kids wandering off where there are no eggs. No one likes a wild goose chase. I try to set reasonable boundaries, so they know where to look. If the children are among a wide range of ages you can ensure that they get age appropriate gifts by color coding the eggs. For example, two to four-year-olds can look for green and yellow eggs while five to seven-year-olds track down red and orange eggs. Color coding will also allow you to hide the eggs for the young kids in easier to reach places. It is also a great idea for families. Each kid gets a specific color to make the easter egg hunt fair. Set rules to make the hunt fair. For example, make it a rule that no one can open their eggs until all the eggs have been found at the end of the hunt. It’s always more fun when things are fair for everyone. Plus it keeps the day happy when everyone knows and follows the rules. Don’t fill the eggs with only candy. Have a special egg or 2 marked with a star, or a particular piece of paper inside that entitles the finder to an even bigger surprise. Everyone will be looking for that special egg. If you aren’t crazy about the idea of all that sugar, fill your eggs with other fun items; coins, erasers, small toys, etc. You can even fill them with slips of paper that have clues to a bigger prize! Check out these 10 Exciting Easter Egg Fillers that aren’t candy! There is nothing more disappointing than an Easter egg hunt that is over too soon. Make sure you have enough eggs to make it fun. About 20 Eggs per participant is a good number to start with. Hide your eggs properly. Don’t make your three-year-old climb a tree, or a 10-year-old find all the eggs in the grass. Make the hunting age appropriate by hiding the eggs based on the child’s height and abilities. Collect those plastic eggs when the kids are done and put them in storage for next year. They are great to use for your next hunt or Easter decorating. Turn a few of those Easter Eggs into these adorable DIY Lightning Bugs. I hope these tips help you have the best Easter Egg Hunt with your friends and family this year! Check out and print these adorable Peeps For My Peeps Printable Treat Bag Toppers!